BlockCAD is one of those rare programs that make you explain “why didn’t anyone think of this sooner? !” when you see it. This is not a game per se, but a very cool model-building program that allows you to use Lego(tm) blocks to build anything you want—and it’s not even an official Lego product. BlockCAD looks and feels a lot like a combination between 2D painting and 3D modeling programs. Like real-life Lego kits, you will start off with a "base" - a flat gray piece where you'll put the blocks on. The interface is very easy to use: just choose a block from the right hand menu, and drop them onto the base. There are arrows at the top and bottom of the screen that let you turn the design, so you can see what it looks like from any direction. You can choose the colors, sizes, and shapes for most blocks, making them large or small, sloped, or even round in some cases. You can even create some new shapes of your own, save the designs, and print them out to show others. The program even includes unique that you can use to build little Lego people – great for designs that look better with people in them, such as a car or an airplane. If you like the idea of building models but don’t like the way Lego blocks look, BlockCAD lets you deal with that too. Once you finish a design, you can turn off the "studs" (those little round pegs that let the blocks stick together). This makes your design look more like a normal drawing. If you want a more in-depth control over your creation, BlockCAD offers advanced tools such as adding shading to individual blocks, or adding background to your design from any picture you have. 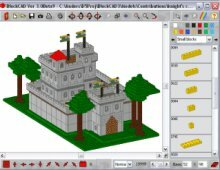 Overall, BlockCAD is a modeller’s dream come true, and a must-have for all Lego fans. Be sure to visit the official BlockCAD gallery to see amazing pictures of models people have created with the program. This download includes the latest version (v2.1) and the latest parts, but be sure to check the official site regularly for new parts to use. Two thumbs up, way up!